Recorded at Eastminster United Church (Labyrinth Musical Workshop Ontario Concert Series), May 12, 2018. This was the first in a series of concerts that were the public-facing segment for a busy first year of the Labyrinth Musical Workshop. 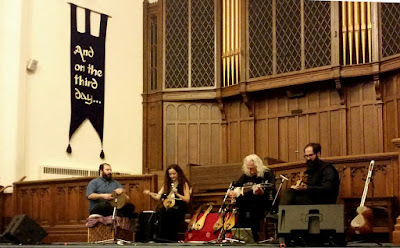 Labyrinth's central component was a series of workshops giving students a chance to have close-up encounters with masters of different modal traditions from around the world — and the chance to hear many of those same masters making rare local concert appearances was the icing on the cake. This opening show saw an ongoing project that mixes two amazing local musicians (Pedram Khavarzamini: tombak; Araz Salek, tar) with two of the founders (Ross Daly: lyra, tarhu, and rabab; Kelly Thoma, lyra) of the original Labyrinth Workshop on Crete. Two sets of music from the quartet mixed traditional tunes with new compositions and saw solo turns all around become embroidered by the group's effortless collective flow. Unfortunately, I wasn't able to make any of the other shows in the series, but I kept hearing amazing things about the visiting headliners as well as the emerging local musicians who opened the shows — and the skills and techniques learned will linger on in the practices of a whole host of local players. Labyrinth is truly something that our "music city" needs more of, so hopefully the conditions will be put in place for this concept to thrive in our soil.